Still not bad compared to the average American. I've been drinking a quart of chocolate milk per day. Some days another quart in evening. Usually I chug a lug a whole quart in one sitting. Now I'm cutting back to 1% milk with a small amount of cocoa powder in it. 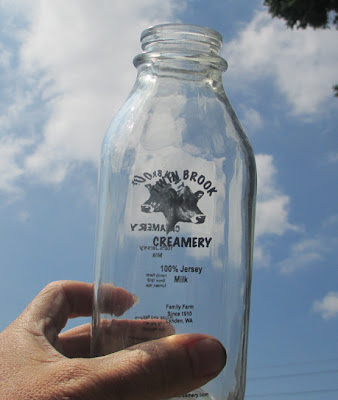 Twin Brooks Dairy, which produces the milk in reusable glass bottles, makes only one brand of chocolate milk that I am aware of. Whole milk sweet and rich. It's so good, they don't want compromise, like a low fat chocolate milk. I remember meeting one of the farmers at the Food Co-op and we discussed the milk. It's like; "talk to your local farmer day." I don't blame them for making their chocolate so rich creamy. They do have low fat regular milk. I can use their 1% and add my own amount of cocoa powder to give it a bit more zest than regular milk. Every once in a while, I'll still drink the full version chocolate milk; like after long bike rides, or dancing. Except for the chocolate milk, I don't consume that much sugar. My blood sugar tested better this year than last as I've cut out most of the sweetened ice tea from the vending machine at work and replaced it with the mostly unsweetened Honest Tea products from the Food Co-op. Some have berry flavors. Not quite as sweet, but still pretty good. So far, I've felt few symptoms from slightly high blood sugar. On some days, I must admit I feel so good it's hard to imagine how I'd feel better, but there is room for improvement; especially on some of the other days. Also looking ahead it's a prevention thing.